For years, Adam Pagnucco gave us an insider's look at the ins and outs of Montgomery County and Maryland politics, both here on JUTP and on Maryland Politics Watch, before stepping away from the keyboard in 2010. That's why I'm honored to have Adam here again with a three-part series on Montgomery County's Bus Rapid Transit plan. 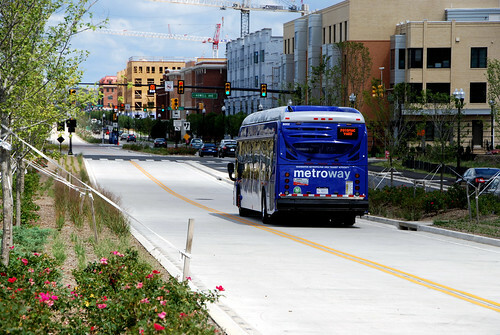 While BRT could be a boon for the county's future, it's mired in controversy. This week, we'll look at the politics behind the county's biggest transit expansion and how we can finally break the gridlock. 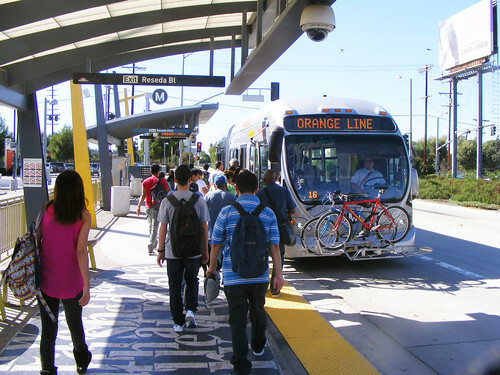 The Orange Line BRT in Los Angeles. Photo by the author. Last winter, County Executive Ike Leggett proposed state legislation that would establish an independent transit authority (ITA) to build, operate and finance a bus rapid transit system as well as operate the county’s existing Ride On bus system. In the face of opposition from many in the community as well as skepticism among county councilmembers and state legislators, the Executive withdrew the proposal. Ike told the Gazette, “If there is a better idea out there, I’m willing to listen to it. But I have not seen it yet.” That’s a fair statement. There is a better idea for launching bus rapid transit. But first, it’s important to understand why the Executive’s proposal failed. There are two big reasons: cost and accountability. The legislation itself does not specify the cost of creating a countywide bus rapid transit (BRT) system or the level of tax increase needed to finance it. But several cost estimates have been made in recent years. Swift BRT in Snohomish County, Washington. Photo by Oran Viriyincy on Flickr. 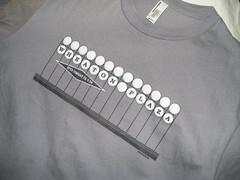 Parsons Brinckerhoff estimated the capital cost of an 18-route, 150-mile system at $2.3-2.5 billion in 2011. The County Executive’s Transit Task Force estimated the capital cost of a 25-route, 162-mile system at $1.83 billion in 2012. Vanasse Hangen Brustin estimated the capital cost of a 10-route, 81-mile system at $2.91 billion in 2013. Annual operating cost estimates at full build-out range from $152 million (VHB) to $178 million (Transit Task Force) to $150-180 million (PB). These are very large costs. The county’s existing Ride On system, one of the largest suburban bus systems in the nation, has annual operating costs of $102 million ($79 million net of fare collections). And the county’s six-year capital budget contains $4.5 billion of projects, including $1.1 billion in transportation projects. Even the smaller version of the county’s BRT system proposed by VHB would swamp both the existing operating and capital budgets for transit. What would this mean for taxpayers? That depends on how any special taxing districts are designed, how much money comes from the state or the federal government and how the tax burden is distributed between residential and commercial properties. The Transit Task Force, which produced the lowest capital cost estimate for a new BRT system, ran some estimates of how much property taxes would have to be increased under different scenarios. After 2020, their estimates of the average annual increase in property taxes required from residential properties to build out their proposed system ranged from $240 to $580 after 2020. The county collects roughly $1.1 billion in property taxes from approximately 300,000 residential accounts every year, resulting in an average residential property tax bill of just over $3,500. So the increases estimated by the Transit Task Force equal 7-16% hikes in residential property taxes. If the higher buildout cost estimated by VHB is applied, the capital cost of the system could require 11-26% increases in property taxes. And that says nothing about further tax hikes to support operating subsidies. At the time that civic opposition stopped the Executive’s transit authority bill, opponents were apprehensive about costs but did not possess the above statistics. If residents come to believe that a transit authority could result in a property tax hike of more than 20%, a tsunami of opposition will drown Rockville. Whatever its merits, the transit authority proposal reduces the level of oversight that the Executive and the council currently have over the Ride On system, which is now housed in the county’s Department of Transportation. Metroway BRT in Alexandria. Photo by BeyondDC. The Executive can hire and fire the Director of Transportation at will. The council has line item authority over the Department’s budget and can add or delete routes and set fares. Such powers would remain over a BRT system if it were also located in the Department of Transportation. However, they would vanish if an independent transit authority were established. A BRT system would collectively be the largest construction project in the history of county government. The elephant in the room when it comes to county construction projects is the Silver Spring Transit Center. It has endured numerous delays, cost increases, defects and disputes and may be headed to litigation. A report by the county’s Inspector General stated, “Fourteen of the 22 relevant construction project controls analyzed for adequacy of design, implementation, and effectiveness were either weak or ineffective.” No county employees are known to have been disciplined in any way for failures of project management. For all its problems, the transit center has one virtue: its presence does not cause significant disruption in its vicinity beyond occasional glares from passersby. In contrast, it is hard to imagine a more disruptive project than a BRT route. 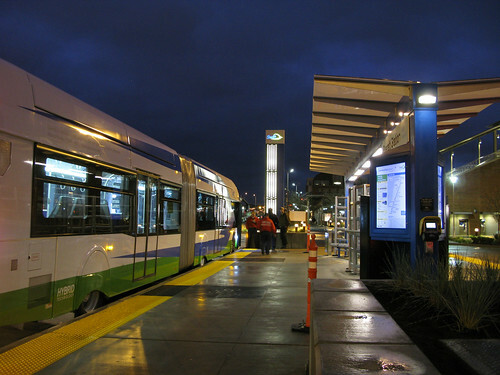 Many of the features that create advantages for BRT vehicles over standard buses require street reconstruction: queue jump lanes, multiple medians, dedicated bus lanes with unique traffic signals for buses, large stations equivalent to light rail stations and more. This says nothing of property acquisitions that are typical of many road projects. The Cleveland HealthLine. Photo by wyliepoon on Flickr. 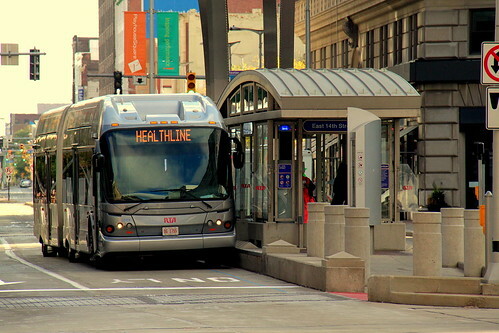 A few years ago, I visited Euclid Avenue in Cleveland when that city’s BRT route, the HealthLine, was under construction. The portion of the street in Downtown was little more than a muddy, nearly impassable trench for cars and pedestrians alike. Businesses on the street struggled to attract customers and many storefronts were closed. Given the difficulties of the Silver Spring Transit Center, a project subject to direct control by the Executive Branch and monetary oversight by the council, imagine how a much more disruptive project insulated from political accountability could play out. Cleveland’s Euclid Avenue BRT route took four years from groundbreaking to line opening. Similar project schedules might apply to Route 355 and Route 29 provided that no difficulties were encountered during construction. And considering that the county has no experience in building BRT, a mistake-free construction process is an optimistic assumption to make. Suppose that cost increases materialize, as they so often do on large construction jobs. A transit authority could conceivably go back to the County Council for an increase in special tax district rates to pay for them. In that scenario, the council would face an intolerable choice between agreeing to the tax hike or allowing a major road artery to remain incapacitated. The transit center debacle would pale by comparison. 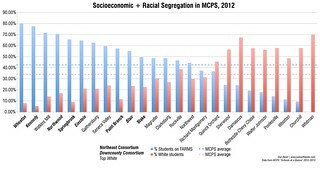 Besides engineering and construction issues, the county has a more serious challenge: resident perceptions. More in Part Two.